On P4X-639, SG-1 meets Malikai, an explorer from another world studying the planet's ruins, including an ancient alien computer that seems to hold the key to the planet's mysteries. The computer draws its power from geomagnetic storms caused by increased solar activity, and as Malikai begins to activate the device, O'Neill and Teal'c are caught with him in a strange blue energy field. Suddenly, O'Neill finds himself back at the SGC, ten hours earlier, eating breakfast, and preparing for the mission to P4X-639 from which he has suddenly just returned. No one can explain why O'Neill and Teal'c insist that events are repeating themselves, but when the phenomenon occurs again, and again, it becomes apparent that all of the SGC is caught in a time loop. 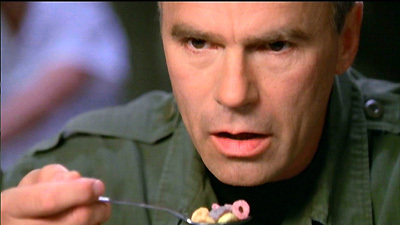 Time after time, O'Neill returns to the same bowl of Fruit Loops as the previous ten hours are repeated, but only O'Neill and Teal'c retain any memory of the previous loops. First they must convince the other members of the SGC that the time loop is real, and then they must find a way to decipher the alien device in order to break the cycle. The writing on the device holds the answers. Built by a colony of the Ancients as a means of time travel to save their dying world, the device had never worked. However, Malikai is convinced that he will find the solution that eluded the Ancients, enabling him to travel back in time to be reunited with his deceased wife. SG-1 must convince him to accept the inevitable, to abandon his quest and deactivate the machine, thus releasing thirteen worlds from an endless loop in time. SG-15 had visited P4X-639 two weeks earlier and brought back reports of increasing solar activity. A coronal mass emission, like a giant solar flare, disrupts the planet's magnetic field and increases surface radiation. The alien device draws its energy from the ionization in the atmosphere caused by the geomagnetic storms with recur every 50 years. The beam from the device can access the gate's subspace field in order to create some kind of time inversion outside of subspace. It establishes a simultaneous connection from P4X-639 to 13 other worlds including Earth and Alaris, creating a subspace bubble in which everything is cut off from the normal flow of time, resulting in a continuous loop repeating every 6 to 10 hours. The writings on the walls and the altar are a variation of the writings of the Ancients, similar to Latin. The equivalent of 400 pages of text includes a planetary history and description of the alien device. The translation revealed that P4X-639 was once a colony of the Ancients. It thrived for thousands of years until it was struck with some unspecified cataclysm. The inhabitants built a time machine to go back and change their own history to avoid their fate, but it didn't work. Instead it caused a short term continuous loop. In the end, they gave up, shut it down, and let the end come. Malikai, an archaeologist, had been making visits to the planet for some time, researching the alien device. His wife had died 12 years ago of a congenital heart weakness, and his hope was to go back in time to be with her. SG-12's unscheduled early return from Alaris was due to a broken ankle. The golfing record was set to the planet Alaris. The book O'Neill was reading was Latin for the Novice, by Joseph Mallozzi (a producer of the series and co-writer of the episode). Domavatus Vestul Motabilium: "Master of an Uncertain Past"
Earth had been cut off in the continuous loop for at least three months. Why? So you can be King of Groundhog Day? Lose it. It means, go crazy... nuts... insane... bonzo... no longer in possessions of one's faculties... three fries short of a Happy Meal... WACKO! !